County Wexford is perfectly positioned for investment growth and development. With excellent transport infrastructure, a well-populated catchment area, a highly educated workforce, a third level college campus and a progressive local authority, Wexford offers investors like you more. The fifth largest region in Ireland, the South East region has a population of 582,440. 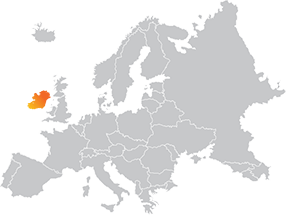 Wexford is the largest town in the south east and, with the capital city of Dublin less than 90 minutes away, the benefits of Wexford and the South East region are many. 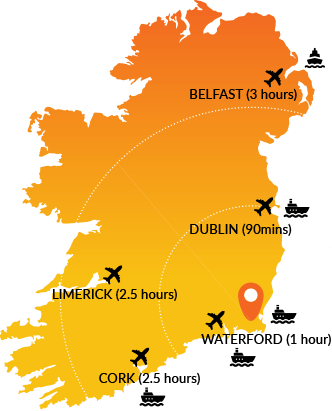 With significantly upgraded road infrastructure in the region along with good port, rail and air access, Wexford offers excellent connectivity into the rest of Ireland, Europe and beyond. Two major by-pass projects valued in excess of half a billion euros are currently under construction in the county and will provide an uninterrupted motorway from Wexford to Belfast along with faster access to the urban centres in the south and west of Ireland. 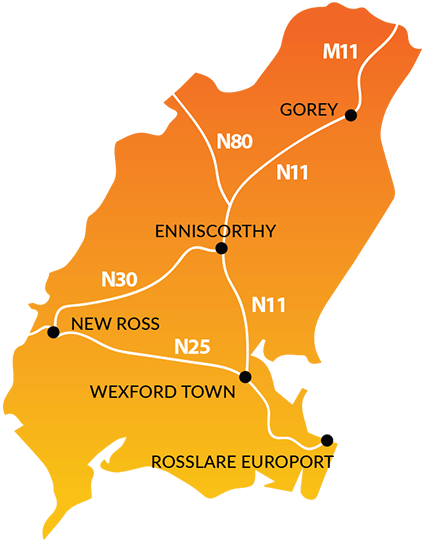 The administrative area of County Wexford has four districts with a large town each: Wexford Town, Enniscorthy, New Ross and Gorey. Wexford Town is the both the largest town in the south east and the capital town of County Wexford. Source: Census 2012, SE Action Plan for Jobs 2016, CSO.ie QNHS Q3 2016, Daft.ie 2016.
have a major love of County Wexford. Wexford is the perfect place for your investment.